Why architects built gargoyles on cathedrals? Monstrous beings of stone; faces with fangs at the tip of long necks, sharp claws reaching to the sky as a warning against wrongful behavior. Lions, dragons, snakes and other creatures hang from the friezes of tens of churches, cathedrals and other buildings across Europe and somewhat less in the rest of the world, giving an evil touch to monuments which, in my opinion, should symbolize hope and joy. It’s been a while since I have been admiring the great variety of gargoyles ornating Europe’s architecture, especially that of the last millennium; it’s also been a while since a tourist guide explained to me their curious origin, easy to see for experts, but not so for those alien to the construction business. True to fact, gargoyles are not such a recent invention, not even from the Middle Ages. Egyptians of the late empire, Greeks and Romans already used them in their majestic structures, generally speaking, in the shape of known animals, lions, dogs, eagles, etc. Only after the first half of the Middle Ages appear the figures of mythological and imaginary creatures. In the Old Age civilizations, architects used them as a practical accessory, but with time, some smart aleck thought that they could be used to send a message to the people. In Egypt, they were sculpted in the shape of lions, so that their strength guarded the buildings against the God Seth and his punishment in the way of storms. It is precisely in this detail where we can find the origin of gargoyles. Egyptian gargoyle (click to see). To respond the title of this entry, gargoyles are just a system to channel rainfall y and to discharge it away from the building so that the water did not damage the stone or the mortar used to build it. It was common to carve in the back of the gargoyle a channel for the water to run off to the mouth and from them to the ground as far as possible from the wall, hence the length of the necks. In Egypt the channels were carved on the legs and the water flowed just underneath the head of the animal, but with the same result. 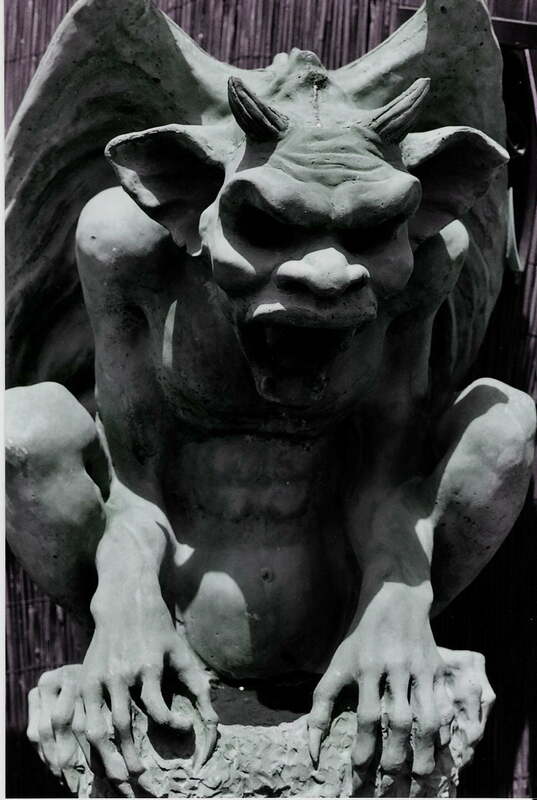 Over time, probably due to the desire of architects to spruce up their buildings, gargoyles became much more elaborated, until they turned into symbols of fear. Apparently, it was during the Middle Ages, a time when most of citizens did not have access to an education, when gargoyles were used to send a visual message. The sponsors of the great cathedrals wanted people to believe that those menacing images protected them from evil spirits, that is, that the cathedral was a safe haven they could visit as often as possible. Not all the priests were glad to see phantasmagoric figures in their churches, but judging by the expansion of catholicism and its power in Medieval Europe, most accepted them. As it is often the case, gargoyles have a legend, mainly one in France “explaining” their origin, or at least their name. Supposedly, some kind of dragon with wings and belching fire, terrorized travelers on a road near Rouan. Saint Romano, at the time the archbishop of the city, chased the monster, called Gargouille (from the latin gargula, throat), captured it and take it back to town to burn it. Since the neck and throat of the frightening beast were tempered by the fire, they couldn’t be burned, so Sanit Romano decided to hang it from one of the corners of the cathedral, as a warning to the bad, very bad spirits. Now, not all the figures we see in cathedrals are not gargoyles proper. If they are just ornaments and do not drain water, they are called chimeras or grotesques, in which case are just there to scare. As it turned out, technology put an end with the art of gargoyles. Beginning on the XVIII century, the invention of the gutter replaced the gargoyles, and not because they were scary, but because they were a danger to passers by when they broke and fell to the ground due to their weight and lack of support. After that, few would be built, but those which remained have served to inspire fantasy tales, such as the Hunchback of Notre Dame and other Disney works. Terrifying or practical, gargoyles are still there and are part of history. 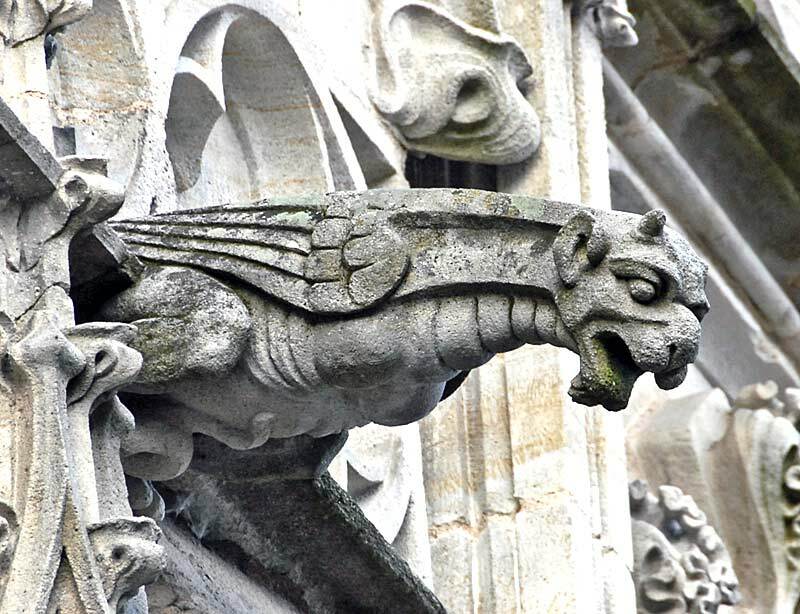 Why architechts built gargoyles on Cathedrals? The tower that was not designed by Mr. Eiffel. What happened to the rays of Japan’s flag ? Cuando un político sí motiva a su pueblo. Gettysburg: 272 palabras que hicieron historia. ¿Por qué el Californian no ayudó al Titanic?